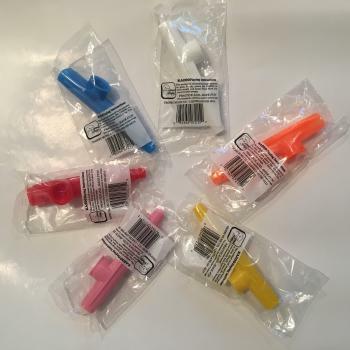 Plastic Kazoos. Safe for three year old's and older. they sound great and make wonderful party favors. The easiest of all musical instruments to play. Simply place the KAZOO in your mouth and hum! Don't blow. Try your favorite songs. PRACTICE AND...HAVE FUN! The product is available in Blue, Green, White, Orange, Red, Yellow, Pink. You can request certain colors, but we can't guarantee them and pick what is available.